The Chosen Few in 1969, L-R Brenny Bonass, Robbie Brennan, Bob Bolton (front) and Deke O'Brien. Beat/soul band managed by Pete Selwood, the man who'd engineered the first Bluesville recordings at his basement studio in Merrion Square in 1964. Deke O'Brien and Mick Molloy joined early on, shortly after Bluesville split in 1966. This band played blues and soul and sometimes used a horn section. They were recorded live at the Cavalier Club on 17 March 1966 supporting Alex Harvey but the tape was lost. Their highpoint was probably supporting The Who at the National Stadium on 7th May 1966. The Chosen Few may have changed name (briefly) to The Limited Company before 1967 (unconfirmed). The band had a fluid lineup. Robbie Brennan was the drummer in May 1966, fresh from the Rootzgroup. By 1967 his place had been taken by Fran Byrne. Alan Hyland also played drums at some point. Bobby Kelly (ex Hootenannys, Greenbeats) may also have played with the band in this period. The Chosen Few split in 1968 when Paul Ashford and Fran O'Toole left to join The Miami and Bobby Kelly joined The Sands. Deke O'Brien reformed The Stellas in the summer of 1968 with Brendan Bonass and Bob Bolton who'd left The Uptown Band. This band split in 1969 and Deke O'Brien and Bob Bolton to reformed The Chosen Few with original members Mick Molloy and Robbie Brennan. Molloy then left for London and Brendan Bonass (ex The Stellas) joined. 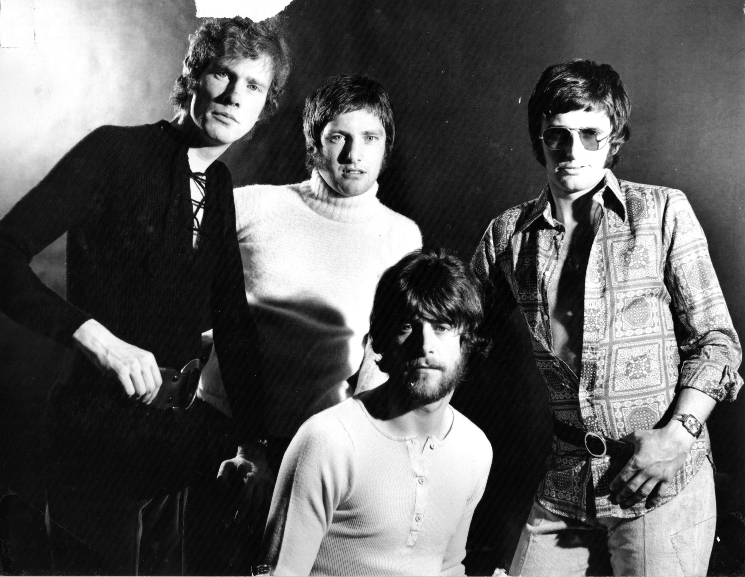 The summer 1969 lineup of Deke O'Brien, Bonass, Bolton and Brennan is pictured above. The Chosen Few were still active in 1971 when they played a concert at TCD in February as part of Human Need Week. Also on the bill were Thin Lizzie and Supply Demand and Curve. Deke O'Brien left for London and teamed up with Mick Molloy in Bees Make Honey circa 1970, shortly before The Chosen Few split. Bobby Kelly and Bob Bolton formed Stepaside. Fran O'Toole and Paul Ashford went on to The Miami; Fran Byrne was also in The Creatures and The Sands; Deke O'Brien & Mick Molloy later in Bees Make Honey; Bobby Kelly and Bob Bolton later in Stepaside.